A man in his 60s died from injuries he suffered when he was struck by a vehicle on a freeway offramp in Santa Clarita and the driver of the vehicle was arrested, authorities said Saturday morning. 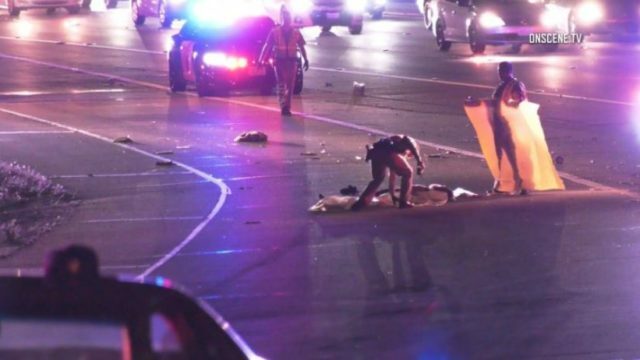 At 9:20 p.m. Friday, the victim was reportedly walking on the right shoulder of the northbound lanes of the Antelope Valley (14) Freeway, south of Golden Valley Road, according to Officer R. Gomez of the California Highway Patrol. Roughly 20 minutes later, the CHP received calls the man was walking in the slow lane of the freeway, Gomez said. The driver of a 2002 Honda Accord traveling north on the Antelope Valley Freeway exited at Golden Valley Road at 9:55 p.m. and saw the man walking within the off-ramp, Gomez said. The driver attempted to pull to the left to avoid hitting the man, but was unsuccessful and struck the victim, who was pronounced dead at the scene. The driver of the Honda, a 25-year-old man from Tustin, was arrested, but the charge or charges against him were not disclosed, Gomez said. His name was not released. All four lanes of the freeway at Golden Valley Road were closed at 10 p.m. for an investigation into the crash. About 11 p.m., three lanes of the freeway were reopened, with the No. 4 lane closed until about 1:15 a.m., when it was reopened, Gomez said.